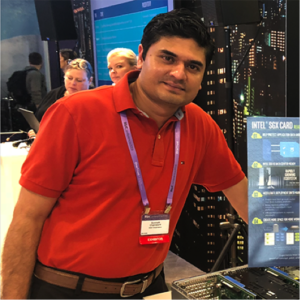 Meet Somnath Chakrabarti, a new ONF community member in the Open Mobile Evolved packet Core (OMEC) project. Somnath joined Intel in 2005 and since 2013, has been a Senior Security Architect in the Security and Privacy Research group in Intel Labs. Somnath lives in Portland, Oregon. Conducts research on next-generation data center security and emerging cloud computing paradigms. Is one of the Intel® Software Guard Extensions (SGX) architects and has made significant contributions to various SGX architectural extensions. Also developed an SGX based key manager solution to help protect secrets in the cloud, offering mutual remote attestation. Has 25+ patents and 5 papers in the field of computer security. Is currently exploring security foundations for next-generation secure telco infrastructure. Protecting 5G network’s data plane along with charging and billing framework. His initial work on protected billing and charging is included in the OMEC codebase, contributed to ONF in March this year. This work helps ensure that billing and charging information has not been tampered with, greatly improving auditability for service providers. “Intel has been a leader in open source contributions for the service provider space and is very committed to advancing open source reference implementations such as ONF’s OMEC. We really appreciate the contributions Somnath has made to advance the availability of OMEC’s reference implementation.” – Christian Maciocco, Principal Engineer – Director Telecom Systems Research at Intel. “Somnath’s work on security is an important piece of OMEC as the project is a release targeted for production environments – for service provider deployments it is critical to have the highest levels of security when it comes to usage data.” – Oguz Sunay, Chief Architect for Mobile Networking at ONF. When Somnath is not working on security research he enjoys programming, hiking, and following India’s growing league of cricket teams.